Every Friday we try to find a new version of one of the traditional songs that are sung in the synagogue or in the home to welcome Shabbat. Shalom Aleichem is the liturgical poem that signals the start of this special 25 hour weekly respite from the workaday world. We never know until Thursday what version of which song we'll be sharing with you on Friday. Sometimes it's Adon Olam, Yedid Nefesh, Eishet Chayil, Lechu Neranena, or Yigdal. 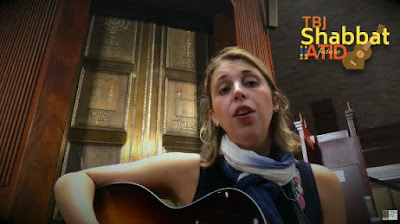 This week we're sharing yet another version of Shalom Aleichem, as sung by Lucy Fishbein, Assistant Cantor at Congregation B'nai Jeshurun in Short Hills, New Jersey.